Small, short-tailed, rounded head perching semi upright; flicks tail quite often. 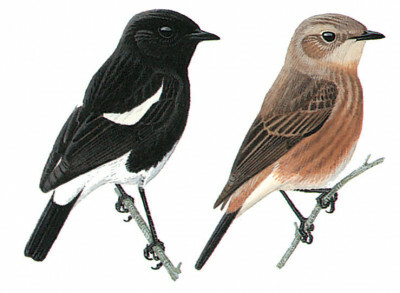 Jet black male unmistakable with white belly, rump and narrow shoulder patch; white patterns above easily seen in low jerky flight. Female has unstreaked sooty earth-brown upperparts and breast, creamy belly and rufous-orange rump; some are rusty brown on breast and have slight supercilium.